Stereotypes and stigma surrounding the art community are not entirely unfounded. Claire Molek, director of the relatively new River North space Hauser Gallery recounted her own experiences and education about the art world. "The more I learned about the art world, the more I got disheartened about what I had to do," she said. Molek, formerly of Wicker Park’s This is Not the Studio, recounted the differences between that space and the larger art world. "That was all about community and hospitality and being able to contribute to an elevated contemporary discourse," Molek said. The space was a chance to create a structured platform for positive growth for community. However, she noted that it was difficult to run a gallery while not selling art or 21 existing in a commercial space. The larger forces and "rules" within the art world left her disillusioned and she eventually left it for eight months. When she returned to the art world, her disillusionment turned into renewed reinvigoration. Molek wanted to "de-sterilize the gallery experience [and] make sure there’s a comfortable space to make people feel welcome." This led to the creation of Brave New Art World, a new "arts unification movement." Premiering Thursday in the River North gallery district, the movement and event is a public forum. It will recur every first Thursday of the month from 5-8 p.m. Featuring artist talks, performance art, and the open doors of such galleries as Catherine Edelman, Jean Albano, and Stephen Daiter, the event aims to provide a more inviting space for those inside and outside of the art community to come together. People live and work in River North, but outside of the immediate vicinity of its popular clubs and restaurants, the neighborhood can feel isolating, abandoned and exclusive. 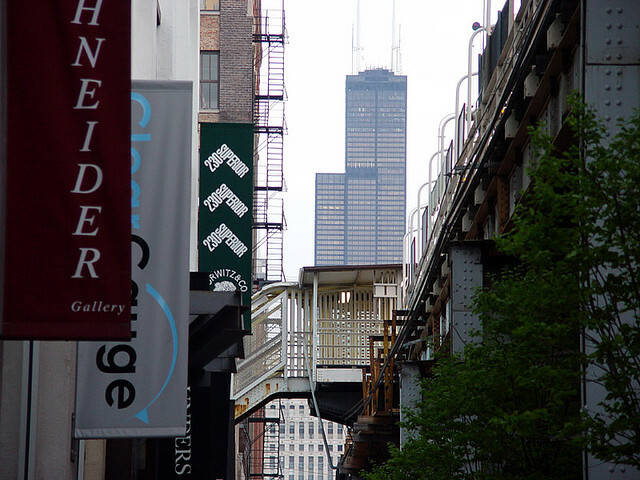 When thinking about the market-driven art world in Chicago (as opposed to other art communities in the city), most reference the River North neighborhood. But the majority of artists living and working in Chicago do not live in the neighborhood. Chicago as a decentralized – even segregated – environment impacts the cultural, racial, and social makeup of the city. This is felt in the beloved but underrated art community. For a variety of artists and audiences, River North – despite its centralization and density of gallery spaces – is a historically-significant, yet inaccessible hub. Access is important not just for the general public, but for all participating tiers in the art world. River North, a neighborhood that can be accessed by multiple train and bus lines, is the perfect meeting point then for those in all "sides" of the city. From a philosophical standpoint, Molek said that we are, "hungrier for human interaction...We want to learn about what is around us and develop our conscious in a different way." Within a few months in her new position as director of Hauser Gallery, Molek realized that the same core tenets built within her smaller gallery practice were needed in this new neighborhood. "I knew we would have to do something more than what we were doing to create a buyer base and breakdown the environment of pretension and elitism," she said. "That’s the environment the art world plays in. I realized I had to make my own politics and standards if I wanted to continue in this community." Chicago has pushed out many incredible artists. People examine the city and wonder, "What are you going to do next?" From a more localized standpoint, the event also aims to bring together the disparate art communities in the city. Brave New Art World is an attempt to address that question while staying true to the needs within the Chicago art community. Molek believes that the young makers and administrators within the city should be looking at the galleries in River North as to how they became successful, while still bridging the gaps between perception and reality. It is easy to buy into the idea of inaccessibility because it has existed for a long time. But in the end, these are often just "antiquated stereotypes." "We think that these places are inaccessible, that these people aren’t nice," Molek said. "But the reality is that all of these galleries want to share." Let Brave New Art World then be the first step in bringing together just one facet of this separate, yet culturally-united city.